Makeup is a woman’s best friend. But if overdone, this friend can easily turn into a foe! There are some basic makeup steps that you need to follow to get your look just right. Remember – the basics of makeup depend on your skin type, skin tone and face cut. Do you have an oval face? Are you tired of looking around for a proper makeup guide for your face type? Is it a nightmare for you when it comes to choosing the basic makeup tools? Don’t worry ladies, help is at hand! I have listed the best makeup tips that will surely add to the features of your oval face! It must be upsetting to find an all new foundation tip every time you search the web for a suitable foundation for oval face. Don’t get carried away with lame claims! There is no way you can transform your overall look by simply changing the foundation you currently use! If you have an oval face, all that you need to do is stick to the foundation that is closest to your complexion. Yes, the foundation you use depends on your complexion and not the face shape, and all the brands claiming otherwise are just misleading you! Did someone tell you not to highlight your lips if you have an oval face cut? Have you been facing constant criticism for lip makeup that looks unnatural and overdone on your face? 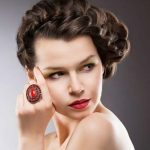 If yes, then you might just find the answer to perfect lip makeup for oval face shape right here! It is not complementary to your features to highlight your eyes and lips simultaneously. It looks extremely overdone and ruins the complete look of the face. You can surely add a lot of drama to your lips by using mysterious dark lipstick shades, attractive glosses, and sparkles. The only thing you need to keep in mind is keeping your eye makeup simple while highlighting your lips. Oval face can carry each eye dramatization with utmost grace. If you are an eye makeup lover like most women, then creating drama with creamy shadows and thick lashes must be your cup of tea. If ever you faced embarrassment due to heavily dramatized eye makeup, it was never the fault of your face cut. Instead, you must have highlighted your lips and eyes, both at the same time. As mentioned above, choose to add drama to either your eyes or lips, but don’t try to create magic with both at the same time! A sneak peak to the book of styling makeup tips for oval face shapes unearths the basic art of using bronzer. You may stick to simpler shades or choose the louder ones, but you need to use very little amount of your bronzer. Applying thick layers of bronzer from your contour kit will ruin your look totally. Oval face needs just a little touchup at the cheeks. Try being lighter on the bronzer part and note the huge impact it creates. Since cheekbones occupy the widest part on an oval face, this tip can be the biggest factor in making and breaking one’s overall look. Never use the same shade of bronzer and highlighter for oval face. If you use a darker bronzer, complement it with a lighter highlighter and vice-versa. Same shades of highlighter and bronzer bring out a choker’s face that you certainly would not be interested in! This makeup tip is not just for oval face beauties, but for all the sassy divas who love makeup. Playing with mild coral and light pink blush can add a lot of beauty to your face. Remember to use a powdered pink blush with in and out strokes (very gentle) to complete your face makeup. Lip gloss adds more magic to the oval face when compared with any other high impact lipstick. Oval face gets a scintillating finish with lip glosses. If you can just manage without lipsticks, you might just believe in what I say. Insist on adding a lot of eye drama (cat eye makeup for instance) and stick to using sultry shiny lip glosses for evening parties. Oval face might be the perfect shape on paper, but this face cut (along with heart shape faces) needs a lot of patience to get the correct and desired looks. But nothing is too difficult for our readers, right! Just follow these tips and you are sure to set many a hearts on fire for sure! Do you use any of the above-mentioned tips to enhance the beauty of your oval face? Is there an additional tip you would like to share with our readers? Share with us in the comment section.